National anthem " God Save the Queen"
The British Virgin Islands (BVI) is a British overseas territory, located in the Caribbean to the east of Puerto Rico. The islands make up part of the Virgin Islands archipelago (the remainder constituting the U.S. Virgin Islands; see also Spanish Virgin Islands). The British Virgin Islands consist of the main islands of Tortola, Virgin Gorda, Anegada and Jost Van Dyke, along with over 50 other smaller islands and cays. Around 15 of the islands are inhabited. 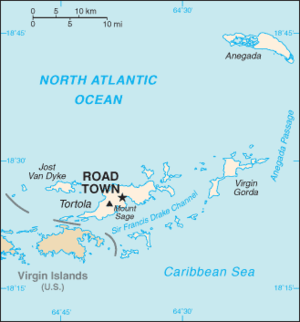 The largest island, Tortola, is approximately 12 miles (19 km) long and 3 miles (5 km) wide. The islands have a total population of about 22,000. 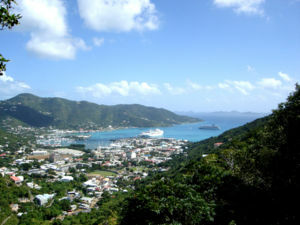 Road Town, the capital, is situated on Tortola. The Spanish Empire acquired the islands in the early 16th century, mining copper on Virgin Gorda, and subsequent years saw the English, Dutch, French, Spanish and Danish all jostling for control of the region, which became a notorious haunt for pirates. During the process of colonisation the native Amerindian population was decimated. The Dutch established a permanent settlement on the island of Tortola in 1648. In 1672, the English captured Tortola from the Dutch, and the British annexation of Anegada and Virgin Gorda followed in 1680. Meanwhile, over the period 1672–1733, the Danish gained control of the nearby islands of St. Thomas, St. John and St. Croix. The British islands were considered principally a strategic possession, but were planted when economic conditions were particularly favourable. The British introduced sugar cane which was to become the main crop and source of foreign trade, and slaves were brought from Africa to work on the sugar cane plantations. The islands prospered economically until the growth in the sugar beet crop in Europe and the United States significantly reduced sugar cane production. In 1917, the United States purchased St. John, St. Thomas and St. Croix from Denmark for US$17 million, renaming them the United States Virgin Islands. Subsequently, the British renamed the islands they controlled as the British Virgin Islands. The British Virgin Islands were administered variously as part of the Leeward Islands Colony or with St. Kitts and Nevis, with an Administrator representing the British Government on the Islands. Separate colony status was gained for the Islands in 1960 and the Islands became autonomous in 1967. Since the 1960s, the Islands have diversified away from their traditionally agriculture-based economy towards tourism and financial services, becoming one of the richest areas in the Caribbean. The British Virgin Islands comprise around 60 semi-tropical Caribbean islands, ranging in size from the largest, Tortola (approximately 12 miles by 3 miles), to tiny uninhabited islets. They are located in the Virgin Islands archipelago, a few miles east of the U.S. Virgin Islands. The North Atlantic Ocean lies to the north of the islands, and the Caribbean Sea lies to the south. Most of the islands are volcanic in origin and have a hilly, rugged terrain. Anegada is geologically distinct from the rest of the group and is a flat island composed of limestone and coral. The British Virgin Islands enjoy a sub-tropical climate, moderated by trade winds. Temperatures vary little throughout the year: typical daily maxima are around 29°C (84°F) in the summer and 25°C (77°F) in the winter. Rainfall averages about 115 cm (45 in) per year, higher in the hills and lower on the coast. Rainfall can be quite variable, but the wettest months on average are September to December. Hurricanes occasionally hit the islands, with the hurricane season running from June to October. The British Virgin Islands enjoys one of the more prosperous economies of the Caribbean region, with a per capita GDP of around $38,500 (2004 est.) . The British Virgin Islands is highly dependent on tourism, which accounts for 45% of national income. 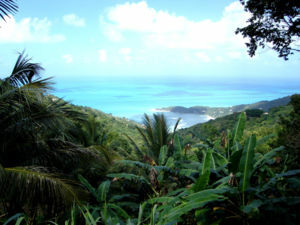 The islands are a popular destination for U.S. citizens, with around 350,000 tourists visiting annually (1997 figures). Tourists frequent the numerous white sand beaches, visit The Baths on Virgin Gorda, snorkel the coral reefs near Anegada, experience the well-known bars of Jost Van Dyke, or charter yachts to explore the less accessible islands. Agriculture and industry account for only a small proportion of the islands' GDP. Agricultural produce includes fruit, vegetables, sugar cane, livestock and poultry, and industries include rum distillation, construction and boatbuilding. Since 1959, the official currency of the British Virgin Islands has been the US dollar, also used by the United States Virgin Islands. The islands are predominantly Protestant Christian (86%). The largest individual denominations are Methodist (33%), Anglican (17%), and Catholic (10%). Being a small group of islands, transportation is limited. There are 113km of roads. The main airport (Terrence B. Lettsome Airport, also known as Beef Island Airport) is located on Beef Island, which lies off the eastern tip of Tortola. Virgin Gorda and Anegada have their own smaller airports. The main harbour is in Road Town.